SoundCloud is one of the leading platforms for people who create and love music & audio. The platform is allowing everyone to share and discover unique content anywhere, anytime, on the web and on mobile. SoundCloud has more than 175 million unique monthly listeners. As the world’s largest music and audio platform, SoundCloud lets people discover and enjoy the greatest selection of music from the most diverse creator community on earth. Since launching in 2008, the platform has become renowned for its unique content and features, including the ability to share music and connect directly with artists, as well as unearth breakthrough tracks, raw demos, podcasts and more. This is made possible by an open platform that directly connects creators and their fans across the globe. Music and audio creators use SoundCloud to both share and monetize their content with a global audience, as well as receive detailed stats and feedback from the community. 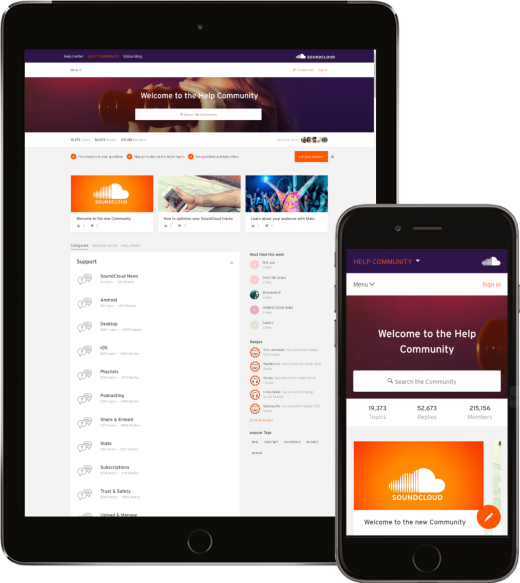 Since sharing is key for SoundCloud they launched a Help Community in October 2014 as a place for people can interact with SoundCloud and its community. SoundCloud users can join the conversation and ask other community members for help when they need it. Moderators and other listeners are available to help out, share their tips and tricks, and provide feedback. SoundCloud’s main challenge is to scale up in order to help more users at a time, without a constantly growing support team. SoundCloud wants to engage users to help each other, provide quality content and make it easily accessible. Their main objective is therefore to empower creators and listeners to enjoy the world’s leading social sound platform to the max by positioning the SoundCloud forum as the preferred, fast and simple online help channel to jointly solve problems and share experiences. In November 2016 SoundCloud migrated from GetSatisfaction to the inSided Platform. By moving to the inSided platform SoundCloud wanted to realize an increase in peer-to-peer support, prevent spam and get better insights into community analytics. Before the technical migration, inSided performed a community success scan of the current platform and held a three-day training to formulate clear objectives and goals, together with actions to improve the quality of content, traffic and activation. Visit the SoundCloud Help Community. We are very happy with the way the project was managed, both from a purely professional side and a cultural fit between SoundCloud & inSided point of view. SoundCloud isn't the only one reaping results. More than 95% of our customers exceed their KPIs. Join the world's leading brands and start scaling customer success with inSided. KPN delivers mobile, landline, TV, and internet service to millions of customers in Europe and are under constant pressure to deliver a world-class experience.